Verizon's Droid Does Website is Awesome! Verizon’s Droid Does Website is Awesome! For some strange reason, I either haven’t noticed this until now, or Verizon updated their website, but I was just checking out Verizon’s Droid Does website and man… it is awesome! 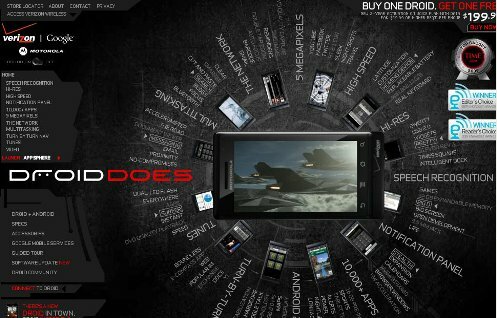 If you haven’t yet, you need to check out the Verizon Droid Does website. Now I’m not an expert web developer and it’s not what I do for a living, but I’m around it enough and dabble in it enough to know that something like the Droid Does website was not cheap – by any means. I’m guessing that it is built using flash, because of the motion involved. But I suppose that can be achieved with the new HTML5 protocol as well. But the cool thing is that even though the Droid phone is always moving and changing, all the little icons around the Droid phone are active links – meaning, you can click them – it’s basically the Droid does navigation bar. Anyway, I have to admit that I am very impressed with Verizon’s Droid Does website – very cool stuff and very high tech indeed. I would give it an A+ if I had to grade the website, and especially if the grading system was based on what kind of impact or impression does it give the Motorola Droid phone. One cool thing I just noticed is there is a little sub link under the “Notification Panel” navigation section called Stealth. If you click it, the Droid Does Stealth commercial will start playing. So I wonder who put up the money for the design and development of that website. Was it Verizon, Google, Motorola, or all 3?